A full home surround sound system is an amazing addition every audiophile or movie buff would want in their living spaces. However, these multi-speaker system setups tend to take up too much space. And let’s be real, not every one of us has the luxury of having a large enough living room or bedroom to accommodate multiple speakers and a big television. But thanks to fast-evolving audio technology, you can find a way around this dilemma. Instead of purchasing bulky floor and freestanding speakers, you can opt for in-ceiling and in-wall speakers instead. These discrete speakers can offer the same sound quality as their counterparts while saving you the trouble of constantly tripping on ceiling speaker wires and having to sacrifice sitting space just to accommodate your bulky sound system. So, look no further. We’ve gathered the best ceiling speakers available in the market in a convenient list below. Take a look at their specs and features to know which appeals to your needs and budget the most. And if you’re a newbie when it comes to audio equipment, you can read through our short buying guide below to make sure you have all the information to make a wise purchase. If you don’t want to hire someone else to install your speakers, you might find the Yamaha NS-IW280CWH in-ceiling speaker system a great choice. This in-ceiling speaker is marketed as a versatile and easy-to-install equipment and virtually invisible. You’ll only need a few basic tools to install it on your own. It also comes with a paintable frame and grill which you can keep as is or painted to match your room’s design scheme. Not only that, this ceiling speaker also features swivel mount tweeters which enables it to produce high-frequency sounds and enable these sounds to be directed to a specific listening area for a customizable listening experience. The Polk Audio RC801 in-ceiling speakers have created a fanbase of satisfied users over the years and it isn’t hard to see why. These speakers produce lifelike overhead sound effects that move sound up and down, side to side and front to back. Thus, they are great additions to any home theatre setups. However, they can also be enjoyed in more simple setups. Their 8” drive size woofers are more than enough to fill a room with rich sounds and solid base. Their built-in swivel mount tweeter also enables the user to direct sound to a specific area in a room for better acoustics. If you’re looking for a set of speakers that you can use in a variety of setups and environment, these Acoustic Audio CS-IC83 in-ceiling speaker systems maybe the best ceiling speakers for you. They’re built to last and withstand any environment with their high rigidity poly cone woofers and butyl rubber surrounds. You can use them indoors as either in-ceiling or in-wall speakers and outdoors as part of your poolside or patio deck audio systems. They can also be used as part of industrial sound systems and marine audio systems. The Acoustic Audio CS-IC83 in-ceiling speakers are your heavy-duty audio companions. The Pyle PDIC60T is a two-way in-ceiling speaker system which can also be used as an in-wall speaker. Its main selling point is its promise of delivering stereo sound and hassle-free easy installation. It produces full and rich sound with its titanium dynamic balance soft dome tweeters with voice coil and impressive power handling capabilities. Each ceiling speaker has a maximum power of 250 watts. This Pyle 6.5” in-ceiling speaker also has integrated wiring and an amplifier transformer switch which makes for quick and easy speaker connection. The speaker system package includes a cut-out template to help you during installation. Not only that, they’re also very aesthetically-pleasing with a clean and sleek look. This next one is for music enthusiasts who want to take their listening experience up a notch. The Micca M-8C promises smooth and atural vocals, robust bass output and abundant detail and clarity in the sounds it produces. It does all these through features such as its high excursion 8” poly cone woofer and dynamic balance soft dome tweeter with co-axial tilt. The tweeter uses a diffuser to improve sound direction aiming to accurately find that natural sound ‘sweet spot’ and to broaden the listening area covered as well. Thus, this ceiling speaker system creates a realistic sound stage without sacrificing sound resolution even in large areas. Not only that, the Micca M-8C can also be used alone without added boost from an external subwoofer: a great way to save up on precious floor space. The Theater Solutions TS80C in-ceiling surround speakers are specifically designed to deliver powerful bass in a compact equipment. With a low range-friendly frequency response range, this Theater Solutions in-ceiling speaker promises to produce high quality and lush bass sounds. It is marketed as being the best surround sound in-ceiling speaker system for playing movie scores and classical music. Its other features are its sophisticated design and moisture -resistant body which ensure great natural sound performance and equipment longevity. It also has paintable frames and grills so you can match it with your current room décor. You can use the Theater Solutions TS80C speakers for a variety of applications like in home audio surround sound and for office and other commercial settings. The Polk Audio 80 F/X RT is an 8” surround speaker which promises to stay efficiently hidden yet functional after installation. As part of Polk’s Vanishing Series, you can easily hide this in-ceiling loudspeaker as its painted to match most house decors. Once installed, they will be ‘virtually indistinguishable’ from their surrounding area. Despite this efficient camouflaging ability, the speaker’s sound can still be controlled through its custom audio controls. Thus, you can install this speaker in any position to achieve more lifelike natural sound effects. It also has a dual offset ring radiator tweeter which extends frequency response to produce detailed and realistic sounds. Meanwhile, its dual bandpass bass ports make the Polk Audio 80 F/X RT loudspeakers efficient for small enclosures. If you think in-wall speakers will be a better fit for your current audio setup, check out the JBL SP6II in-wall surround sound loudspeakers. They’re great for both recreating cinematic sound for your home theater setup and just listening to music. This JBL loudspeaker promises to distribute sound smoothly and evenly in your living room or other open spaces through its Proprietary Elliptical Oblate SpheroidalTM waveguide technology and peak power handling of 80 watts per speaker. Not only that, this JBL loudspeaker delivers amazing bass with its 6.5” titanium-laminate low-frequency cone woofer while also delivering excellent and clear high-frequency sound through its swivel mount tweeter and voice coil. Lastly, its shallow mounting depth of 98 mm allows for more versatile easy installation options on the part of the user. The Polk Audio RC85i in-wall speakers may be the all-around in-wall speakers in the market. They can be used in a variety of setups, whether for movie watching or listening to music, may it be set up inside your home or out on your patio. This Polk Audio speaker is ideal for surround speakers for in-wall home theater setups but are also excellent for music systems. Not only that, its 8” woofer and tweeter combo also enable it to deliver amazing natural sound for sports games and video games. Another perk of these speakers is that they are very easy to install. All you’ll need to do is to cut a hole where you’ll feed the speaker wires through and then simply placing the speakers where it will be safely secured by rotating cams. This is the in-wall version of the Micca in-ceiling speaker mentioned above so they have, more or less, the same features and specifications except for a few things. You’ll find this Micca in-wall speaker useful in a variety of applications and mounting locations. The Micca M-8S in-wall speakers are great as front or center speakers for home theaters, as surround speakers for surround sound setups and as background music speakers. Another difference between the two Micca speakers is their shape. The Micca in-ceiling speaker is round while the Micca in-wall speaker is rectangular in shape. Now that you have an idea of which in-ceiling and in-wall speakers are considered the best right now, it’s time to narrow down your choices even more. Here are some considerations you should keep in mind when picking the best ceiling speakers for your home sound system. 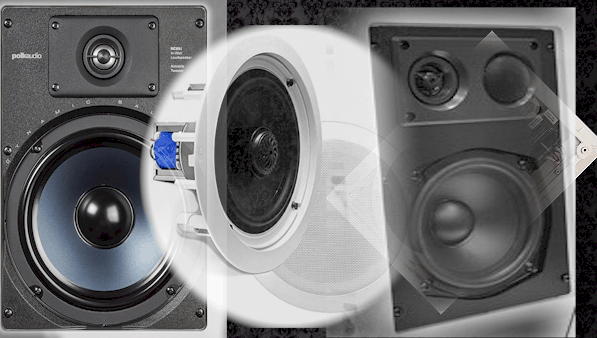 These two speaker types may have functional and aesthetic differences, but they have very similar selling points. In-ceiling speakers, meant to be installed recessed into ceilings, are a great choice for homeowners who want to declutter their living room but don’t want to sacrifice a complete audio setup. With in-ceiling speakers, you can say goodbye to unsightly audio wiring as this speaker’s wiring runs behind walls. They are also called architectural speakers because they can blend well with most room décor due to their sleek and minimalistic look. They usually come in round shapes, though square-shaped models can also be bought. Don’t worry much though. In-ceiling speakers work like any other speaker and its shape won’t affect its sound much. In-wall speakers offer the same appeal. More and more people are starting to prefer this type of speakers as the technology that makes them are now catching up with that of the classic floor and freestanding speakers. Structure-wise, in-wall speakers usually come in a rectangular shape as compared to their round in-ceiling counterparts. Both types of discrete speakers are ideal for a multi-room sound system that needs a source of sound to fill a larger area. Another important factor you should consider when choosing the best ceiling or wall speaker is its drive size. The drive size, measured in inches, determine how loud the sounds a speaker can produce. As a rule, units with larger drives can produce louder music and lower frequencies as well than their smaller counterparts. Common drive sizes are 5”, 6.5” and 8”. Knowing a speaker’s power specification (measured in watts) can help you determine the maximum amplifier power that a speaker can handle and vice versa. Matching a speaker to the proper amplifier is important as to not overpower or underpower your speaker. Make sure that your speaker’s power doesn’t exceed the maximum power handling of the amplifier you will pair it with. ​A speaker’s sensitivity rating, measured in dB, pertains to how it uses the power received from an amplifier. Higher sensitivity ratings mean that you can play louder music without straining your amp too much. Meanwhile, frequency response (Hz) will tell you the range of sound a speaker can produce. For comparison, humans can hear sounds in the 20 to 20,000 Hz range. ​The mounting depth, measured in mm and sometimes in inches as well, gives you an idea of how much space your speaker requires for it to fit in your ceiling or wall. Swivelling tweeters: This feature allows the user to angle a speaker’s sound towards a preferred area. Not all in-ceiling and in-wall speakers have this feature. High/mid frequency adjustment controls: This feature allows users to adjust the sound of the speaker even after they are already installed inside the ceiling or walls. Moisture-resistance: This is a useful feature if you want to place your speakers in a humid area like the kitchen, the bathroom or outside on the patio. The moisture-resistance will help your speakers stay dry and prevent damage caused by moisture ensuring your speaker’s longevity. Stereo single speakers: This type of in-ceiling and in-wall speaker plays both channels (right and left) through a single woofer with two angled tweeters. Thus, they are ideal for placement in narrow or awkward spaces where two speakers won’t fit. How you’ll arrange your chosen in-ceiling and in-wall speakers in your existing or planned home audio system will matter just as much as the quality of these speakers. Most homeowners prefer to recreate the surround sound system that is often found in movie theatres in the comfort of their own homes. 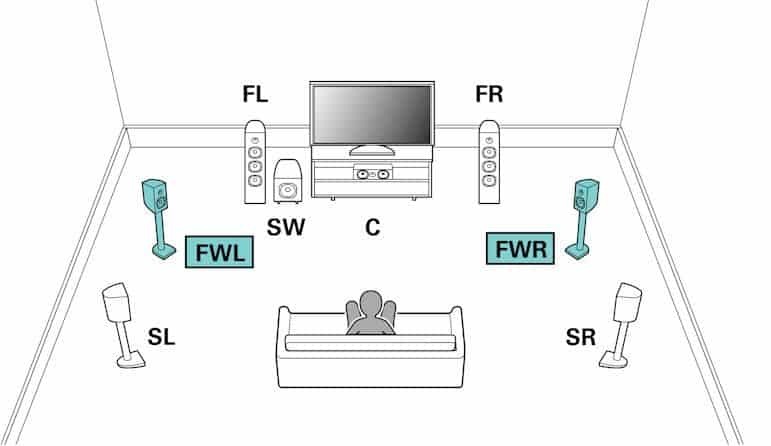 The surround sound setup is a technique of sound reproduction in which additional audio channels (speakers) are arranged to literally surround the listener. 5.1: This setup requires five speakers and a subwoofer to deliver that cinematic sound in your living room. 7.1: This setup adds two more audio channels to the 5.1’s setup. The 7.1 setup uses the standard front, center and subwoofer speaker configuration. 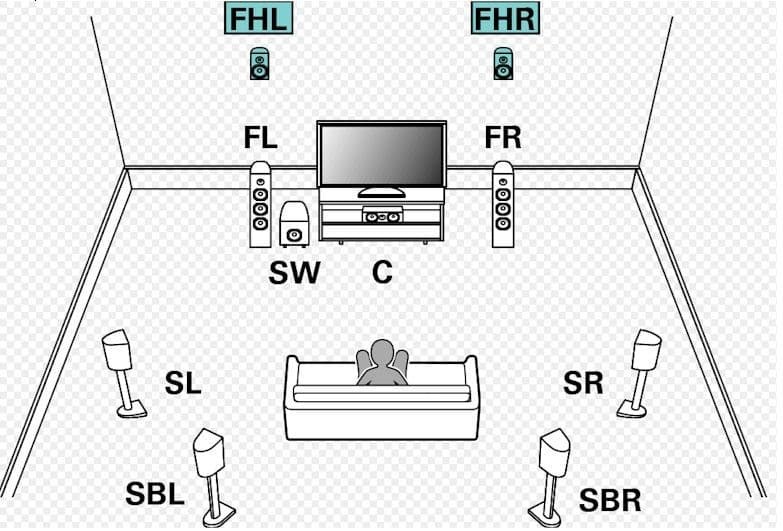 In the image shown below, you can replace the freestanding speakers with either in-ceiling or in-wall speakers. 9.1: This setup is basically the 7.1 but with the addition of two front height audio channels (speakers). If you want to hear a realistic recreation of how the helicopters in Apocalypse Now travel and other similar iconic movie scenes, you better aim for this setup. Among the three setups, this is the most ‘immersive’ so far. If you plan on setting up your new speakers yourself, you’re going to need some additional tools and accessories. Wires: Be sure to only use wire that’s approved for in-wall runs when installing your in-ceiling and in-wall speakers. Professionals recommend using UL-rated wire which is classified as either CL2 or CL3. You can find some here. Back boxes: This will help contain the sound of your in-ceiling speakers to where you want it. They also help improve your speaker’s bass. Find some back boxes here. In-wall volume control: Installing an in-wall volume control dial will make volume easier to control and get right. You can find volume control models here. There’s a wide variety of in-ceiling and in-wall speakers in the market now there’s surely one that’ll fit perfectly with your needs. It can be difficult to wade through tons of reviews and models and specs. So, we hope this guide has been helpful in your search for the best ceiling speakers to complete your home audio system.